Def Leppard played in Hershey, PA last night on the 2018 tour and gave fans a preview of a forthcoming release. During the pre-show PA music a cover of a Depeche Mode classic was heard with Joe Elliott on lead vocals. A new Lep version of 'Personal Jesus' was heard at the HersheyPark Stadium prior to Joe's announcement of Phil Collen's absence. This is very likely to have been the cover song recorded on 16th May at Spotify's studios in New York. The Spotify Singles session featured one original song and one cover and will be released soon. Joe commented on the session in an interview with Eddie Trunk. Video director Lee Ford also posted a photo from the studios on his Instagram account. Listen to a snippet in the video below recorded by Chele Drappel who reported live from the show. The original was released in August 1989 and eventually included on their classic 1990 album 'Violator'. It reached Number 13 in the UK and Number 28 in the USA. In a very brief video clip Joe can be heard singing a few lines from the start of the song - "Your own personal Jesus, Someone to hear your prayers, Someone who's there." 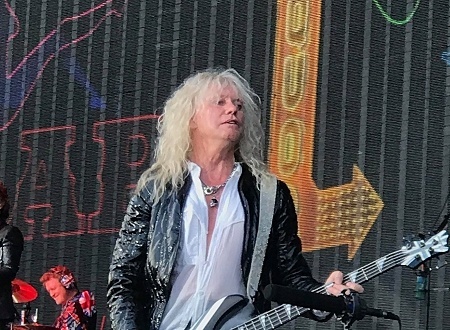 Rick Savage is known to be a fan of the band and once said his favourite song was 'Shake The Disease'. Update - The song was played on the PA before 'Rocket' and a second clip has been added below showing Rick getting ready as the song played. "So we're based in the New York area let's say because we're kind of back and forth everywhere round Manhattan doing stuff. We were in a place called S.I.R. which is a very famous rehearsal space where Bowie and everybody in the world's probably used it, The Who. We were in there for a couple of days rehearsing for a, the tour and b, for a session that we did for Spotify. I don't know whether I'm allowed to mention then on your show. Yeah we did a session for them. Just two songs. I won't say any more because I don't want to spoil the surprise for whenever it's gonna get broadcast, but bit of fun. One of ours and a cover of somebody else's stuff ."